Censor List Improvements: We made the censor list more flexible by adding support for phrases, prefix and postfix matches, in addition to the already-supported wildcard and exact matches. We also improved our word input interface for the censor list. Member Profile Queue: We added support for a new Member Profile Review queue. The Member Moderation Queue now encompasses both a Registration Approval queue and this new Profile Review queue. You can use recipes to place changed profiles into the new queue for review. Improved Sort Filters for QuestionShark: We enhanced our support topic lists by having distinct dropdown menus controlling filters and sorting, including support ascending and descending sorts, where applicable. User Moderation Triggers: With the addition of a member profile review queue, we also added ways to place things in that queue automatically, via recipes. You can, for instance, review profiles when a email addresses (or other profile fields) are changed. 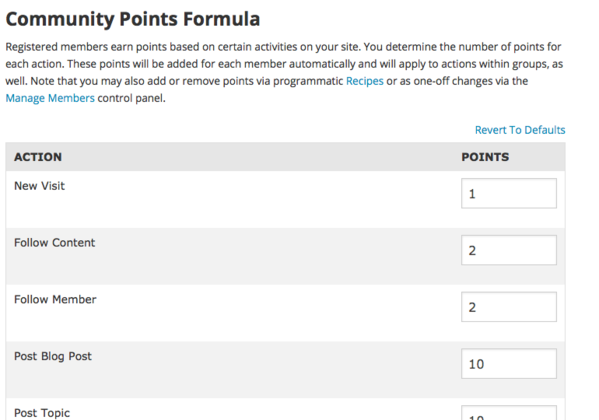 Customizable Points Formula: Super Admins can now customize the community points formula on the new "Community Points Formula" page of the Admin Control Panel. RSS Widgets Now Asynchronous: If you are including RSS widgets on your pages, we've improved performance by ensuring that these load asynchronously, after the rest of the page finishes loading. 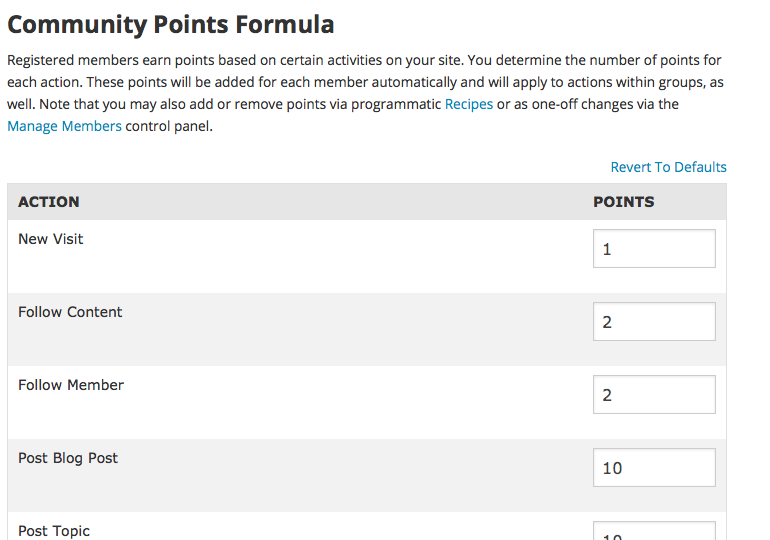 Add/Remove/Set Points: You can now add, remove, or set points for users, either via the Manage Members control panel or via recipes. Added Support For Targeting Specific Permissions Circles For Content Moderation: When you create a content moderation recipe (formerly a content moderation rule), you can now optionally limit who can review the content triggered by the recipe to specific admins. Super Admins will always be able to view all content in the moderation queue, but they will see tabs for "Your Queue" and "Complete Queue". This feature is great for large sites that want to divvy up content moderation in a more targeted manner. The biggest feature by far is the Recipes feature, which we describe in greater detail here. As usual, there are numerous other minor improvements and bug fixes. Thanks Brian, will do. Really interested in the possibilities of recipes. The company I work for has a home-grown forum system that isn't doing well so I took them on a tour of the Hoop.la site I manage and they were very impressed. IMO it would be better to migrate to a Hoop.la community than continue down the path of the DIY approach. I'll submit a support topic to discuss the trigger for the scenario we've been talking about. It would depend on what trigger you use for that recipe. If you'd like further assistance or have further questions, can you please create a new support topic, and we'd be happy to assist you further. It's a bit more difficult to tailor the support to you in the blog's comments section. Strange. The upgrade wouldn't have impacted that. If you are able to identify any specific scenario where things may be going awry, it would be great if you could put in a support topic with more details. No worries, we only have a couple custom permission circles and it only took a minute to restore content moderation to this group. On the other hand, I just created my first recipe! We get a lot of spam so new members are placed into a moderated permission circle and have be cleared by a moderator which adds them to a different permission circle. The recipe I created automates this (at least in theory b/c I'm not sure how to find/use a recipe). Hi Brian, the only recent change that was made to this permission circle was that some members were removed. No permissions were edited though. Today we received comments from existing members that none of them could edit posts which was one of the granted permissions. When I investigated I noticed that only the admins had the moderate content permission. Weird. The Recipes release shouldn't have impacted your forum permissions in any way. Is it possible that another administrator made the permission change? Hey Ted, looking forward to playing with recipes. Do you know if the release would have inadvertently impacted our permissions groups. We have one group who lost the ability to edit member posts in the forum they were assigned to. I had to go back and give them the Moderate Content permission.